Samuel Richardson first erected a two-storey frame home on the site in 1873. Later adding a third storey in 1875, once complete it was named Richardson House and converted to a hotel. The addition of a four-storey brick extension was completed in 1885. Samuel Richardson died in 1904. In the ensuing years ownership and name changed several times. In 1906 renamed Hotel Falconer acquired by Robert Falconer. Charles Ziegler purchased it in 1914 then renaming it Zeigler’s Hotel. By 1917 the hotel was foreclosed on and ownership transferred to the Imperial Bank of Canada. 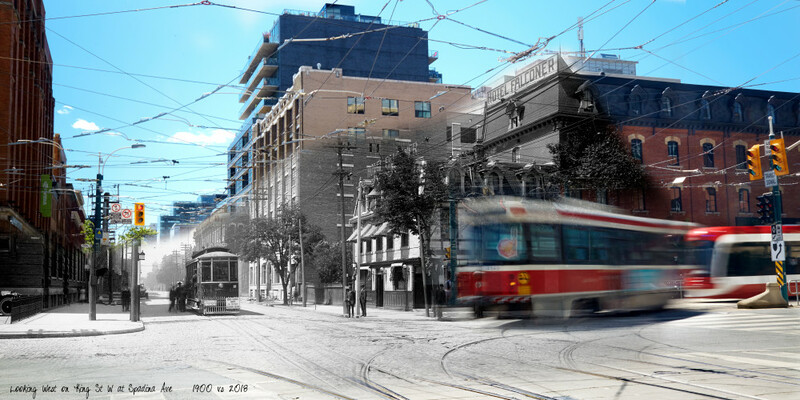 The next name change was to the Spadina Hotel which remained for the next eighty years. Renamed the Global Village Backpackers, it operated from 1997 until January 2014. In July 2014 the site was purchased and an extensive renovation undertaken. Reopening the site in 2015 as an innovation hub and revealing it’s original beauty.